Italian food may have influenced the world’s cuisine but Italians have also been influenced. One origin story of Spagehetti Carbonara is one brilliant example of this. At the end of WW2 during the occupation, Italian chefs in Rome found they had an abundance of guanciale (Italian cured pig jowl, similar to bacon but not smoked) and eggs, by adding Pecorino Romano cheese and parsley to spaghetti they created a delicious and true Italian-American dish! Salute Americano! Pancetta is often substituted for guanciale because of availability. 1. Take a medium sized bowl and mix the eggs, pecorino romano, parsley a bit of salt and black pepper, set aside. 2. Cook the spaghetti al dente; before adding the pasta to boiling salted water you can begin making the sauce. 3. In a large pan, heat 2-3 tbsp olive oil in a sauce pan over medium heat. Add the cubed guanciale or pancetta. 4. 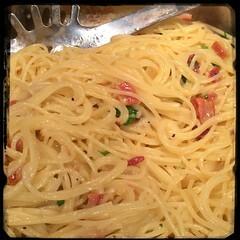 Once the pancetta or guanciale becomes golden brown and crispy add the minced garlic and and cook until the garlic begins to brown (be careful not to burn the garlic, it will turn bitter). 5. Add the cooked pasta to the pancetta or guanciale and garlic and mix well mixing well. 6. Add a ladle of the pasta water, mix well and then fold in the egg mixture. Add some peas for a delicious variation.